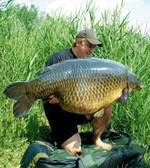 The web's number one source for Carp fishing news, views, pictures, videos, tackle, tactics, tips, rigs and bait! The web’s number one source for Carp fishing news, views, pictures, videos, tackle, tactics, tips, rigs and bait! Daiwa Emcast Plus 5500: The subject of Reels always starts a great debate so over the next few weeks we thought we would have a look at few. The Emcast Plus Range boasts all the normal quality assets you would expect from Daiwa. The most impressive feature is by far the line lay is almost perfect, as well as being ultra smooth and quiet the reel makes for a great casting machine. The only criticism is that once attached to the rod the spool is a little to far away from the reel seat, making controlling a running fish with your index finger a little difficult, but don't let this put you off, as Karl from Scorpion tackle pointed out "you have got two hands use them" ! Add a bait runner converter and you have a super reel for the price! Each month Simply Carp.com seeks out the top rods from around the world and brings you an insight to their methods and tactics. Miguel thanks for taking the time to talk to SC and thanks for supporting our young site. Your one of the good guys for sure! We've all watched your catches on the forums and I had the pleasure of fishing with you way back when I first arrived in the US. When did you move over from Portugal? Regular visitor might notice a new look, please let us know what you think?